I ordered a Killer KG-Stallion from Ishibashi recently, my third guitar purchase from this Japanese online store. But why a Killer you might ask? Well, here's a little background. I saw Japanese metal band Loudness play a concert in Singapore in 1989. To be honest, I wasn't really a fan of their music -- something about the razor-like guitar tones and mispronounced English lyrics made me cringe a little bit. And who knew what they were singing about in Japanese? No offence meant to Japanese readers of The Guitar Column. But despite his less than dulcet tones, I could hear that their guitarist, Akira Takasaki, was a decent player in the Van Halen/Randy Rhoads tradition. For a good 2 hours, as the band belted out many of their past hits and played every song from their Soldier Of Fortune album, Takasaki was an exhilarating showman and consummate virtuoso. He had obviously been working on his shred chops and was alternate picking and sweeping with the best of them, every note as clear as a bell. Add to that his unique overhand tapping technique and I realized that he had stepped out of the shadow of Eddie Van Halen and Randy Rhoads. Throughout the show, Takasaki's tone was warm, rich and singing, with just the right amount of bite for those crushing riffs. I realized then and there that this was the 'brown sound' that Eddie Van Halen had been talking about in all the guitar magazines for years. Here it was, up close and personal. Standing in front of his Marshall half-stacks, Takasaki brandished one of the weirdest looking guitars that I had seen up to that point. 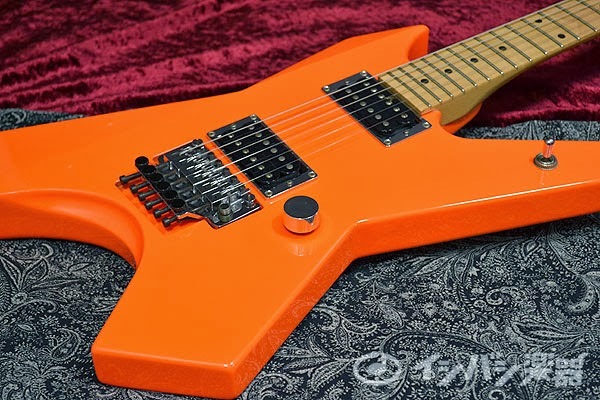 Bright orange, two humbuckers, single volume and tone controls, the ubiquitous Floyd Rose trem, and a shape that looked like it stepped right out of Japanese Anime. And what was with that 5-plus-1 tuner arrangement? I guess I never shook the impression that Takasaki's orange Killer guitar made on me that evening. As I played, owned and experimented with various Ibanezes, Fenders, Gibsons, Suhrs and Tylers over the years, Takasaki's Killer never came to the forefront of my consciousness as a 'must-own' guitar. You might say that it was lying dormant in the back of my mind all these years. All it needed was a trigger. That trigger came in the form of lunch at an Indian vegetarian restaurant 2 weeks ago, with my ol' buddy Eric. I've known Eric since 1991 when we were both crazy about shred guitar and home 4-track recording -- the whole Ibanez JEM into an ADA MP1 and ADA MicroCab cabinet simulator era. We also found that a Boss Metal Zone into the ADA MicroCab worked just as well, if not better, but that is a story for another day. At lunch, Eric told me about a reissue Ibanez RG550 that was going for below a 1000 bucks at our local music store. I was curious so we headed down to the store, but not before Eric stated, in his usual matter-of-fact manner that the guitar 'had no vibe.' Meaning that I should not get my hopes up, expecting that slinky, super-low action, vintage RG550 feel of decades ago. What greeted me at the store was indeed a blast from the past. Decked out in nearly luminous, day-glow Road Flare Red, this made in Japan reissue RG550 seemed to whisper 'hello' in a sultry voice as I picked it up. We put it through its paces for nearly an hour and I'd forgotten how much I enjoyed getting those stratospheric harmonic pull-ups on the Ibanez Edge tremelo. A vintage-style Edge trem I should point out, and none of that Zero Point nonsense. 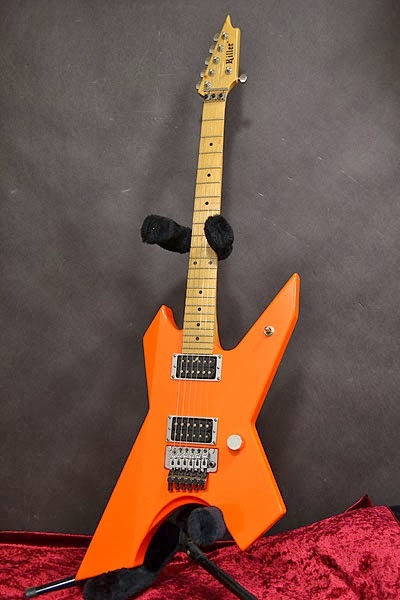 A little online research revealed that this was not the overpriced 20th Anniversary RG550 that Ibanez released in 2007, but a Japanese market-only reissue 550. It's always interesting when made-for-Japan-only guitars occasionally slip through the cracks and float to our shores. So what does all of this have to do with our Killer KG-Stallion order? Be patient, I'm getting there. I've always bought guitars to bring them out to play at gigs. But somehow, I couldn't see myself playing a Road Flare Red RG550. But bouncing around the web looking up the reissue RG550 revealed a Killer KG-Stallion OS. That's 'Orange Sunshine' in case you were wondering. For those of who know me, a Gibson SG looks like a glorified ukulele on my person. The RG550 would have looked tiny -- I'm not exactly 6 feet tall and 80kg anymore. The Stallion, on the other hand, looked large enough, a bit like my Firebirds, but without the somewhat oversized, be-careful-or-you'll-hit-it-against-a-wall headstock. 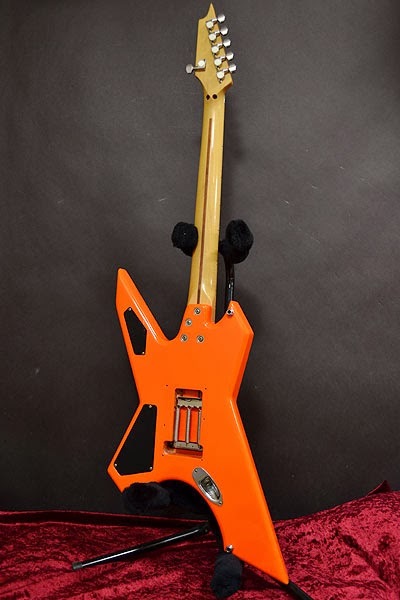 According to the Killer website, the KG-Stallion OS is a discontinued model -- the word 'discontinued' always gets me going, for various reasons -- and features an ash body, one-piece maple neck, single volume control, three-way pickup selector, Killer LQ-500 pickup in the neck position and a Killer Dyna-Bite in the bridge. The bridge is an Original Floyd Rose tremelo. 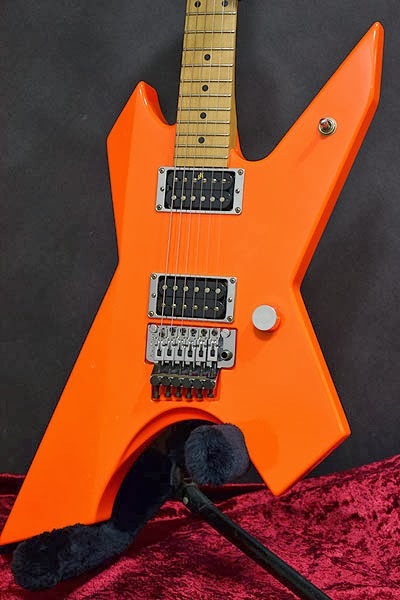 I've never owned a guitar with an original Floyd Rose trem before, although I've had extensive experience with the Ibanez Edge and Jackson licensed locking trems. For a while, I even endured breaking many brand-new, still-shiny strings that snapped off at the ball-end when I owned a guitar with a Kahler tremelo. I've always felt the Ibanez Edge to be the ultimate vibrato locking system, but after a few days with the Floyd Rose I can see why it is still being used by so many guitar manufacturers today, especially on their high end models. There's something about the Floyd Rose that somehow feels more solid and reassuring than even the Ibanez Edge. To put it simply, the Edge feels like it was made out of lighter, cast metal whereas the Floyd feels like it was milled out of a solid steel block. And I really dig those Killer pickups. They remind me of the old DiMarzio PAFs, medium output and very warm sounding with an even frequency response. Apparently, the LQ-500 and Dyna-Bite are designed to Takasaki's specifications and are made in Germany. I wonder if there is any affiliation to Schaller in this regard. Since I was getting the Killer guitar used from Ishibashi's U-Box, the previous owner had even thoughtfully installed a push-pull switch on the the volume pot to coil-tap both pickups simultaneously. He had also graced the guitar with a cigarette burn at the headstock between the 5th and 6th string tuners. I'm not complaining as it adds some street cred to the guitar as well as knocking down the price considerably. Other than a few minor dings and a bit of paint chipping on the longer lower horn of the guitar -- a common malady amongst Killer guitars it seems -- I received the guitar in near perfect condition, thoroughly packed in more bubble wrap than I've seen used on a single item. And thanks to Japan's EMS and Singapore's SpeedPost, the guitar was at my doorstep within 3 days of my order! A funny note, although this particular model is listed as 'Starrion' on many websites -- the name invoking, perhaps, images of Transformers robots and Gundam Mobile Suits -- 'Starrion' is actually a mispronunciation of 'Stallion'! Killer guitar indeed. Things have a funny way of coming full-circle.